To integrate with SendLane, simply follow the steps below. - Do not jump around. FOLLOW THEM TO THE T.
FIRST and before you do anything else, please create a LIST from within your SendLane account. If you are unsure of how to create a list, please visit the SendLane Help Center tutorial here! 1. Log into SendLane. Go to LISTS. Make sure you already have one! If not, please refer to the SendLane Help Center tutorial above to CREATE a list. 2. 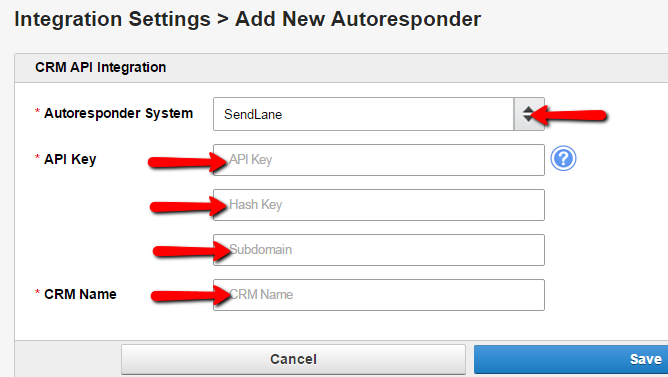 Go to the TOP right to ACCOUNT SETTINGS inside of Sendlane. 9. Enter Info that you copied from Steps 4 & 5 into the appropriate fields - the CRM name is just a name for your own reference. *NOTICE: You must have a LIST already created before you begin the integration to get the GREEN CHECK. *NOTICE: If you have another integration and have it listed under ALLOWED DOMAINS - Please ADD Under the approved domains, add "server.gsdserver.com".